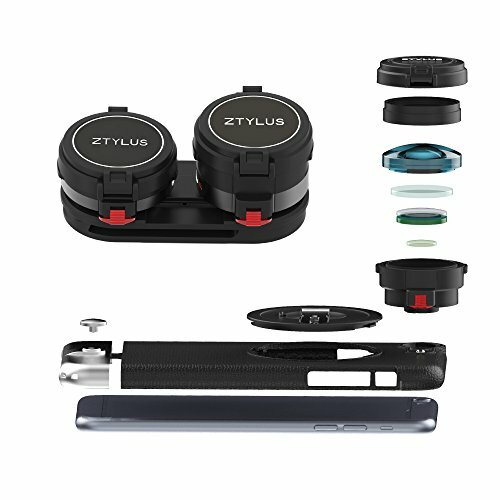 The Z-Prime Lens Kit is the essential starting point for building your professional iPhoneography system. Choose the premium Z-Prime Lens that best fits your photographic needs to capture professional grade photos and videos. Each lens has 5 glass elements in 4 groups that enable corner to corner sharpness with ultra low distortion. The lenses are optically engineered to be perfect at their respective focal lengths. Professional grade image sharpness with outstanding optical quality. Advances in the iPhone cameras require top quality lenses to take advantage of the extended resolution and 4K capability. Our Z-Prime lenses have a resolution of 300 LM/mm and chromatic aberration is dramatically reduced at the edges. The Super Wide Angle Lens gives you that extra UMPH! Capture dramatic images and videos by increasing your field of view. The .63X lens gives you a 100° field of view with virtually no distortion. Get twice as close to your subject with no degradation of the image quality. It doesn't matter if you're taking a portrait or you just want to be closer to the action. The Z-Prime Lens Carrier is included to make storage and transportation safe and simple. The Lens Clip holds 2 Z-Prime lenses and clips to most bag straps, belts and backpacks. Always keep your Z-Prime Lenses available with the Z-Prime Lens Clip. If you have any questions about this product by Ztylus, contact us by completing and submitting the form below. If you are looking for a specif part number, please include it with your message.